Service dogs and therapy dogs are often seen as synonymous, but the truth is that there is a vast difference between the two. Both have very different responsibilities, training, and limitations. One is not interchangeable with the other. So what exactly is the difference between service dogs and therapy dogs? Service dog training is designed to aid their handlers, who have some form of disability, to make their day to day life easier. They allow the handler to attain independence and can provide them with some security. They are so much more than simply pets. In fact, the majority of handlers strictly do not allow their service dogs to be pet, as it can interfere with them properly performing their job. 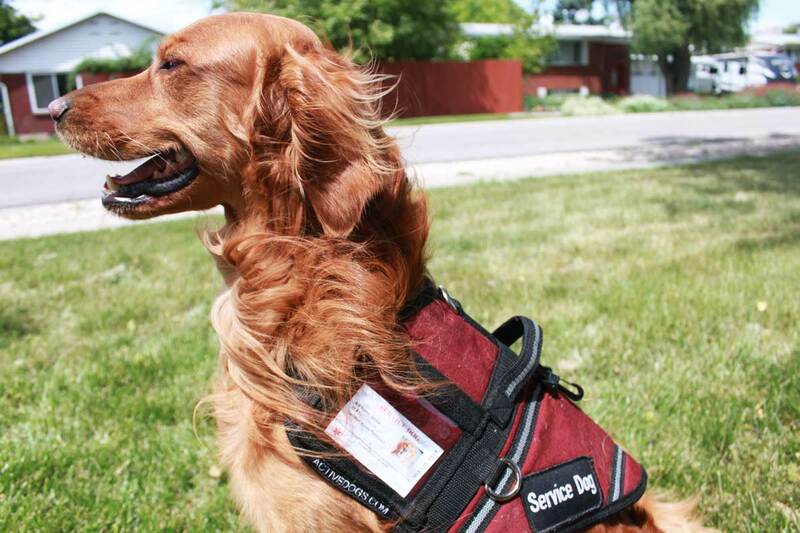 While therapy dogs also receive training, their job is entirely different from that of a service dog. Where a service dog is trained to help their handler, a therapy dog is actually trained to psychological and/or physiological support to people other than their handlers. They are invited into a facility or event to provide support and comfort. Though the two often get mixed up, their responsibilities are actually entirely different. Service dogs are specifically trained to assist their handler because of a disability. Types of service dogs include guide dogs for the blind, mobility assistance dogs for people with mobility restrictions, hearing dogs for the deaf or hard of hearing, seizure response dogs for people experiencing an epileptic seizure, and many more. Therapy dogs are peaceable, calm, friendly dogs who visit high-stress environments like hospitals and nursing homes to ease and cheer people around them. Visiting with a therapy dog in a tense setting can soothe anxiety, lower blood pressure, and increase levels of endorphins. Training is more rigorous for a service dog than a therapy dog. They can be trained by a professional or the handler (with or without professional assistance, but assistance is recommended), but they are required to be thoroughly trained in proper public behavior and disability-related tasks. Their job is to help mitigate the stress of a disability, and focus must be stressed on learning those duties. Training should take around one to two years, during which the Americans with Disabilities Act is not applicable. Therapy dogs can be trained by pretty much anybody, but their training must meet the standards set by whatever national therapy dog organization you choose to register with. They are most often handled by their owners, but can be handled by a trained professional in some cases. Dogs of all sizes and ages can be trained. The only requirements are that your dog is sociable, friendly, and uplifting. You can even get started early by training your puppy to be a therapy dog. Despite the training and registration a therapy dog must go through, they do not have the same legal rights as service dogs. The Americans with Disabilities Act legally protects handlers to bring their service dogs with them anywhere they may need assistance. This includes airplanes, museums, hospitals, pet-restricted housing and other settings where dogs would normally not be allowed. In addition to these rights, however, service dog handlers have a responsibility to ensure that their service dogs are on their best behavior. Public establishments can ask that a service dog be removed if it is being disruptive. Therapy dogs are only allowed where they are invited to visit, and must obtain permission from the establishment they wish to enter beforehand, such as nursing homes and hospitals. They are not protected by the Americans with Disabilities Act, and have no rights to enter an animal restricted area. At first the differences between a service dog and a therapy dog may not seem like much, but once you look a bit closer it becomes clear that the two are nothing alike. The two are far from interchangeable. But both are incredibly helpful and loyal companions to have. If you’re contemplating making your dog a service dog or a therapy dog, make sure you’ve done your research and know exactly what each title means and requires. Do you have any questions or concerns? Contact Dog Training Elite Utah today, we’re happy to help!